Then Adam put the garage door up, and I jumped out of my chair. 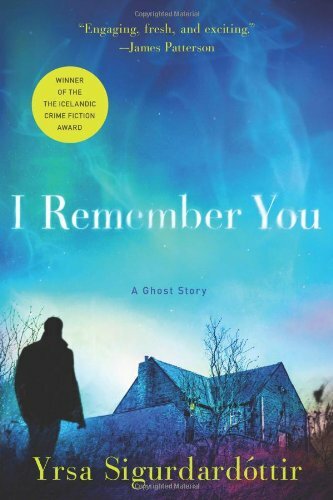 I Remember You by Yrsa Sigurdardottir is pretty much the perfect horror novel for me: it's not overly gory, most of the scary stuff is off-stage and hinted at but when it does appear lives up to the hype, and it's so tightly plotted if it were a girl in a corset, it would have fainted by now. Bonus: It's translated from Icelandic! Woo! The book starts with two alternating storylines that at first don't seem remotely connected, and then slowly, the web spins out and we start to see the ties between them. It's one of my favorite constructions, and I've seen it done really well and really not and everywhere in between, but Sigurdardottir uses it to SUCH creepy effect. The second thread is about a psychiatrist who has been asked to help the police with a preschool vandalism case. He's distracted by memories of his young son who disappeared several years prior and his unstable ex-wife who hasn't found a productive way to process their loss. This book is a little long to be read in one sitting, but trust me, once you pick it up you won't want to put it back down until the bitter end. It's the perfect read for a dark, stormy night. Or if you're me, the middle of a sunny afternoon with all the lights blazing.